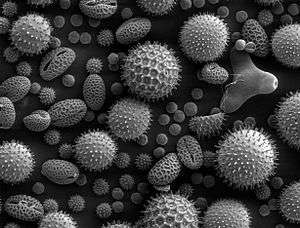 Pollen grains from a variety of common plants can cause hay fever. Rhinitis or coryza is irritation and inflammation of the mucous membrane inside the nose. Common symptoms are a stuffy nose, runny nose, sneezing, and post-nasal drip. In rhinitis, the inflammation of the mucous membrane is caused by viruses, bacteria, irritants or allergens. The most common kind of rhinitis is allergic rhinitis, which is usually triggered by airborne allergens such as pollen and dander. Allergic rhinitis may cause additional symptoms, such as sneezing and nasal itching, coughing, headache, fatigue, malaise, and cognitive impairment. The allergens may also affect the eyes, causing watery, reddened, or itchy eyes and puffiness around the eyes. The inflammation results in the generation of large amounts of mucus, commonly producing a runny nose, as well as a stuffy nose and post-nasal drip. In the case of allergic rhinitis, the inflammation is caused by the degranulation of mast cells in the nose. When mast cells degranulate, they release histamine and other chemicals, starting an inflammatory process that can cause symptoms outside the nose, such as fatigue and malaise. In the case of infectious rhinitis, it may occasionally lead to pneumonia, either viral pneumonia or bacterial pneumonia. Sneezing also occurs in infectious rhinitis to expel bacteria and viruses from the respiratory system. Rhinitis is very common. Allergic rhinitis is more common in some countries than others; in the United States, about 10%–30% of adults are affected annually. Rhinitis is categorized into three types (although infectious rhinitis is typically regarded as a separate clinical entity due to its transient nature): (i) infectious rhinitis includes acute and chronic bacterial infections; (ii) nonallergic (vasomotor) rhinitis includes idiopathic, hormonal, atrophic, occupational, and gustatory rhinitis, as well as rhinitis medicamentosa (drug-induced); (iii) allergic rhinitis, triggered by pollen, mold, animal dander, dust, Balsam of Peru, and other inhaled allergens. Rhinitis is commonly caused by a viral or bacterial infection, including the common cold, which is caused by Rhinoviruses, Coronaviruses, and influenza viruses, others caused by adenoviruses, human parainfluenza viruses, human respiratory syncytial virus, enteroviruses other than rhinoviruses, metapneumovirus, and measles virus, or bacterial sinusitis, which is commonly caused by Streptococcus pneumoniae, Haemophilus influenzae, and Moraxella catarrhalis. Symptoms of the common cold include rhinorrhea, sneezing, sore throat (pharyngitis), cough, congestion, and slight headache. Nonallergic rhinitis refers to rhinitis that is not due to an allergy. It was formerly known as vasomotor rhinitis as the cause was thought to be vasodilation caused by an overactive parasympathetic nerve response. It is now encompassed under the more general classification of nonallergic rhinitis. The diagnosis is made upon excluding allergic causes. It is an umbrella term of rhinitis of multiple causes, such as occupational (chemical), smoking, gustatory, hormonal, senile (rhinitis of the elderly), atrophic, medication-induced (including rhinitis medicamentosa), local allergic rhinitis, non-allergic rhinitis with eosinophilia syndrome (NARES) and idiopathic (vasomotor or non-allergic, non-infectious perennial allergic rhinitis (NANIPER), or non-infectious non-allergic rhinitis (NINAR). In vasomotor rhinitis, certain nonspecific stimuli, including changes in environment (temperature, humidity, barometric pressure, or weather), airborne irritants (odors, fumes), dietary factors (spicy food, alcohol), sexual arousal, exercise, and emotional factors trigger rhinitis. There is still much to be learned about this, but it is thought that these non-allergic triggers cause dilation of the blood vessels in the lining of the nose, which results in swelling and drainage. Non-allergic rhinitis can co-exist with allergic rhinitis, and is referred to as "mixed rhinitis." The pathology of vasomotor rhinitis appears to involve neurogenic inflammation and is as yet not very well understood. Vasomotor rhinitis appears to be significantly more common in women than men, leading some researchers to believe that hormones play a role. In general, age of onset occurs after 20 years of age, in contrast to allergic rhinitis which can be developed at any age. Individuals with vasomotor rhinitis typically experience symptoms year-round, though symptoms may be exacerbated in the spring and autumn when rapid weather changes are more common. An estimated 17 million United States citizens have vasomotor rhinitis. Drinking alcohol may cause rhinitis as well as worsen asthma (see alcohol-induced respiratory reactions). In certain populations, particularly those of East Asian countries such as Japan, these reactions have a nonallergic basis. In other populations, particularly those of European descent, a genetic variant in the gene that metabolizes ethanol to acetaldehyde, ADH1B, is associated with alcohol-induced rhinitis. It is suggested that this variant metabolizes ethanol to acetaldehyde too quickly for further processing by ALDH2 and thereby leads to the accumulation of acetaldehyde and rhinitis symptoms. In these cases, alcohol-induced rhinitis may be of the mixed rhinitis type and, it seems likely, most cases of alcohol-induced rhinitis in non-Asian populations reflect true allergic response to the non-ethanol and/or contaminants in alcoholic beverages, particularly when these beverages are wines or beers. Alcohol-exacerbated rhinitis is more frequent in individuals with a history of rhinitis exacerbated by aspirin. Aspirin and other non-steroidal anti-inflammatory drugs (NSAIDs), particularly those that inhibit cyclooxygenase 1 (COX1), can worsen rhinitis and asthma symptoms in individuals with a history of either one of these diseases. These exacerbations most often appear due to NSAID hypersensitivity reactions rather than NSAID-induced allergic reactions. The antihistamine azelastine, applied as a nasal spray, may be effective for vasomotor rhinitis. Fluticasone propionate or budesonide (both are steroids) in nostril spray form may also be used for symptomatic treatment. The antihistamine cyproheptadine is also effective, probably due to its antiserotonergic effects. A Cochrane review on non-allergic rhinitis reports improvement of overall function after treatment with capsaicin (the active component of chili peppers). The quality of evidence is low, however. Allergic rhinitis or hay fever may follow when an allergen such as pollen, dust, or Balsam of Peru is inhaled by an individual with a sensitized immune system, triggering antibody production. These antibodies mostly bind to mast cells, which contain histamine. When the mast cells are stimulated by an allergen, histamine (and other chemicals) are released. This causes itching, swelling, and mucus production. Symptoms vary in severity between individuals. Very sensitive individuals can experience hives or other rashes. Particulate matter in polluted air and chemicals such as chlorine and detergents, which can normally be tolerated, can greatly aggravate the condition. Characteristic physical findings in individuals who have allergic rhinitis include conjunctival swelling and erythema, eyelid swelling, lower eyelid venous stasis, lateral crease on the nose, swollen nasal turbinates, and middle ear effusion. Even if a person has negative skin-prick, intradermal and blood tests for allergies, they may still have allergic rhinitis, from a local allergy in the nose. This is called local allergic rhinitis. Many people who were previously diagnosed with nonallergic rhinitis may actually have local allergic rhinitis. A patch test may be used to determine if a particular substance is causing the rhinitis. Rhinitis medicamentosa is a form of drug-induced nonallergic rhinitis which is associated with nasal congestion brought on by the use of certain oral medications (primarily sympathomimetic amine and 2-imidazoline derivatives) and topical decongestants (e.g., oxymetazoline, phenylephrine, xylometazoline, and naphazoline nasal sprays) that constrict the blood vessels in the lining of the nose. Chronic rhinitis in form of atrophy of the mucous membrane and glands. Chronic form of dryness of the mucous membranes. Chronic rhinitis associated with polyps in the nasal cavity. In the case of infectious rhinitis, vaccination against influenza viruses, adenoviruses, measles, rubella, Streptococcus pneumoniae, Haemophilus influenzae, diphtheria, Bacillus anthracis, and Bordetella pertussis may even help prevent it. The management of rhinitis depends on the underlying cause. For allergic rhinitis, intranasal corticosteroids and antihistamines can be used to suppress inflammation and control symptoms. Coryza may have its roots in the Greek Koryza, which is likely to be compounded from "kara" and "zeein", which are the noun for head and the verb, to boil. Coryza would therefore be a boiling over of the head. According to another source, coryza was an ancient Greek word denoting a fool. According to physician Andrew Wylie, "we use the term for a cold in the head, but the two are really synonymous. The ancient Romans advised their patients to clean their nostrils and thereby sharpen their wits." ↑ Pfaltz, founding authors, Walter Becker, Hans Heinz Naumann, Carl Rudolf (2009). Ear, nose, and throat diseases: with head and neck surgery (3rd ed.). Stuttgart: Thieme. p. 150. ISBN 9783136712030. ↑ Sullivan, Jr., John B.; Krieger, Gary R. (2001). Clinical environmental health and toxic exposures. p. 341. ↑ Quillen, DM; Feller, DB (2006). "Diagnosing rhinitis: Allergic vs. Nonallergic". American family physician. 73 (9): 1583–90. PMID 16719251. ↑ Wilken, Jeffrey A.; Berkowitz, Robert; Kane, Robert (2002). "Decrements in vigilance and cognitive functioning associated with ragweed-induced allergic rhinitis". Annals of Allergy, Asthma & Immunology. 89 (4): 372–380. doi:10.1016/S1081-1206(10)62038-8. ↑ Marshall, Paul S.; O'Hara, Christine; Steinberg, Paul (2000). "Effects of seasonal allergic rhinitis on selected cognitive abilities". Annals of Allergy, Asthma & Immunology. 84 (4): 403–410. doi:10.1016/S1081-1206(10)62273-9. ↑ "Inflammatory Nature of Allergic Rhinitis: Pathophysiology". ↑ "Immunopathogenesis of allergic rhinitis" (PDF). ↑ "Economic Impact and Quality-of-Life Burden of Allergic Rhinitis: Prevalence". ↑ "Clinically relevant outcome measures of novel pharmacotherapy for nonallergic rhinitis". ↑ "Up-date on neuro-immune mechanisms involved in allergic and non-allergic rhinitis.". ↑ Vasomotor rhinitis Am Fam Physician. 2005 Sep 15;72(6):1057-62. ↑ "Vasomotor rhinitis ''Medline Plus". Nlm.nih.gov. Retrieved 2014-04-23. ↑ Silvers, WS; Poole, JA (February 2006). "Exercise-induced rhinitis: a common disorder that adversely affects allergic and nonallergic athletes.". Annals of Allergy, Asthma & Immunology. 96 (2): 334–40. doi:10.1016/s1081-1206(10)61244-6. PMID 16498856. ↑ Adelman, Daniel (2002). Manual of Allergy and Immunology: Diagnosis and Therapy. Lippincott Williams & Wilkins. p. 66. ISBN 9780781730525. ↑ Knipping, S; Holzhausen, HJ; Riederer, A; Schrom, T (2008). "Ultrastructural changes in allergic rhinitis vs. Idiopathic rhinitis". HNO. 56 (8): 799–807. doi:10.1007/s00106-008-1764-4. PMID 18651116. ↑ Wheeler, PW; Wheeler, SF (2005). "Vasomotor rhinitis". American family physician. 72 (6): 1057–62. PMID 16190503. 1 2 Adams, KE; Rans, TS (December 2013). "Adverse reactions to alcohol and alcoholic beverages.". Annals of Allergy, Asthma & Immunology. 111 (6): 439–45. doi:10.1016/j.anai.2013.09.016. PMID 24267355. ↑ Cardet, JC; White, AA; Barrett, NA; Feldweg, AM; Wickner, PG; Savage, J; Bhattacharyya, N; Laidlaw, TM (2014). "Alcohol-induced respiratory symptoms are common in patients with aspirin exacerbated respiratory disease.". The journal of allergy and clinical immunology. In practice. 2 (2): 208–13. doi:10.1016/j.jaip.2013.12.003. PMID 24607050. ↑ Rajan, JP; Wineinger, NE; Stevenson, DD; White, AA (March 2015). "Prevalence of aspirin-exacerbated respiratory disease among asthmatic patients: A meta-analysis of the literature.". The Journal of allergy and clinical immunology. 135 (3): 676–81.e1. doi:10.1016/j.jaci.2014.08.020. PMID 25282015. ↑ Choi, JH; Kim, MA; Park, HS (February 2014). "An update on the pathogenesis of the upper airways in aspirin-exacerbated respiratory disease.". Current opinion in allergy and clinical immunology. 14 (1): 1–6. doi:10.1097/aci.0000000000000021. PMID 24300420. ↑ Bernstein, Jonathan A. (2007). "Azelastine hydrochloride:a review of pharmacology, pharmacokinetics, clinical efficacy and tolerability". Current Medical Research and Opinion. 23 (10): 2441–52. doi:10.1185/030079907X226302. PMID 17723160. ↑ Gevorgyan, A; Segboer, C; Gorissen, R; van Drunen, CM; Fokkens, W (14 July 2015). "Capsaicin for non-allergic rhinitis.". The Cochrane database of systematic reviews. 7: CD010591. doi:10.1002/14651858.CD010591.pub2. PMID 26171907. ↑ Pamela Brooks (2012-10-25). The Daily Telegraph: Complete Guide to Allergies. Retrieved 2014-04-23. ↑ Rondón, Carmen; Canto, Gabriela; Blanca, Miguel (2010). "Local allergic rhinitis: A new entity, characterization and further studies". Current Opinion in Allergy and Clinical Immunology. 10 (1): 1–7. doi:10.1097/ACI.0b013e328334f5fb. PMID 20010094. ↑ Rondón, C; Fernandez, J; Canto, G; Blanca, M (2010). "Local allergic rhinitis: Concept, clinical manifestations, and diagnostic approach". Journal of investigational allergology & clinical immunology. 20 (5): 364–71; quiz 2 p following 371. PMID 20945601. ↑ Ramey JT, Bailen E, Lockey RF (2006). "Rhinitis medicamentosa" (PDF). J. Investig. Allergol. Clin. Immunol. 16 (3): 148–155. PMID 16784007. Retrieved 29 April 2015.